As you learn to love your teen in ways he or she can receive, you ll be amazed at the joy the teenage years can bring." Start reading How to Really Love Your Teen on your Kindle in under a minute. Most parents would be shocked to discover that their child doesn't feel loved. After all, we go to their school events, drive them where they want to go. How could they not feel loved? And yet, the top issue among children and the source of most childhood challenges is just that, not feeling completely and unconditionally loved by their parents. You thought there could never be a love like the love you have for your child. But then you held your first grandchild. The emotions that flooded you focused to an intense desire to protect and make his or her world secure. Yet it's no breaking news that children face a vastly different world from the one you grew up in--or even the world your children knew. The forces of popular culture are no longer child-friendly. Too often, attitudes and ideas all around us obstruct character formation in children, rather than build it up. Although you long to know that your grandchild will be safe and secure in such a world, maybe you live a great distance away. Or perhaps there's some friction between you and your grandchild's parents, or maybe you just don't keep up with your grandchild's interests the way you would like. Whatever your circumstances, being a grandparent is a unique and wonderful opportunity to stand in the gap against the often dark and discouraging elements of our culture in order to positively influence your grandchild's future. "How to Really Love Your Grandchild" is a book of hope and encouragement for you to provide the extra love and emotional support that only a grandparent can give. Through stories that read like your own life, Dr. Ross Campbell's I'm-in-this-with-you advice will provide failsafe ways to stay close to your grandchildren--no matter what. For those who thought it was too preachy, you need to keep reading. The first few chapters don't have much practical advice (I kept asking myself, yes I know that, but HOW do I do that?). Tthe rest of the book has good information and the practical application I was looking for. 5.0 out of 5 starsOld time sense in rearing children and teens. I wondered why the author's suggestions seemed so old-school. Then I read the About the Author section and saw he was of a former generation and is now deceased. Campbell gives good advice on how to make your child feel loved and accepted, and on what pitfalls to avoid that will rob from your child's "love bank." As I'll probably read this again, I'm giving it five stars. 5.0 out of 5 starsGood stuff for parents with teenagers! Until my wife and I suddenly found ourselves living under the same roof with two suddenly complicated young teenagers, I didn't imagine that a book of this title would be of much interest. As it turns out, I found it a gripping read, full of very sound advice and very helpful in every way. I really appreciated the author's professionalism, clearly a very accomplished counselor, doctor and father of grown children who turned out well! Highly recommended for all parents as this is a really balanced and helpful book on beinga better parent. I'm already dipping into it a second time. 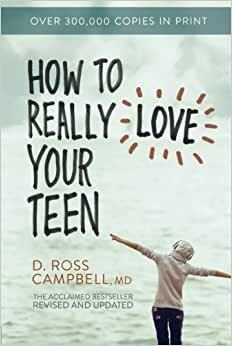 Ross Campbell has written a lot of books to help parents better understand their children at different stages of their life and he has never disappointed us yet. I highly recommend this book for any parent seeking to better. understand and relate to either young children or teens. Great book! When I read the first few pages my immediate thought was oh my goodness...... this sounds sup much like my 13 almost 14 year old. Amazing book. Great ideas to love your teen! I received this book at a discount or for free in return for my honest review.